Updates on the Grambling State University Presidential Search. Several developments have occurred since my last update on the Grambling State University Presidential Search. A team from our search firm, The Hollins Group, visited campus in December to meet with various constituencies and develop a search profile document to assist in recruitment efforts. Click here to view that document. Advertisements for the search are continuing to run in publications nationwide. While applications will continue to be accepted until the position is filled, we have set a priority date for Feb. 13, 2015. Perhaps the most significant development that may impact the search, however, is the budget situation facing all of higher education. The drop in oil prices has significantly altered the state’s economic forecast for 2016. As a result, higher education is facing a possible loss of $383 million. That would equate anywhere from a 40% to 60% loss of state funding for Grambling and the other eight University of Louisiana System institutions. The good news is our friends in the Legislature understand the dire and lasting impacts these cuts would have and are working with us to find funding solutions. The bad news is the budget uncertainties have already presented challenges to recruiting top candidates for Grambling’s Presidential Search. A recent letter from The Hollins Group outlines these concerns. I share this information so you will understand the discussion the search committee will have about potential changes to the timeline when it meets in Baton Rouge on Feb. 24, 2015. The search consultants will be at the meeting to walk through the challenges and provide any recommendations in this regard. Accordingly, the consultants will postpone identifying candidates until this discussion takes place at the next meeting. I am anxious, as we all are, to move the search forward as quickly as possible. However, I also feel a responsibility to make sure we discuss and address unexpected issues with the candidate pool associated with the budget uncertainty. Please continue to visit the search website and provide input to the committee. I also encourage you to show your support of continued funding for our colleges and universities. It is critical that we secure Grambling’s financial stability and future leadership. *An agenda and other meeting details will be posted on the GSU Presidential Search website. When possible, meetings will be webcast live. Want to get the latest information about the Grambling State University Presidential Search? SUBSCRIBE for direct messages from Search Chair Woodley. 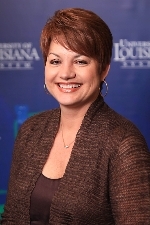 Copyright © 2014 University of Louisiana System, All rights reserved.